Samuel's Blog » If you didn’t see Mary Kissel’s speech and want a better understanding of the current state of American politics, watch it! 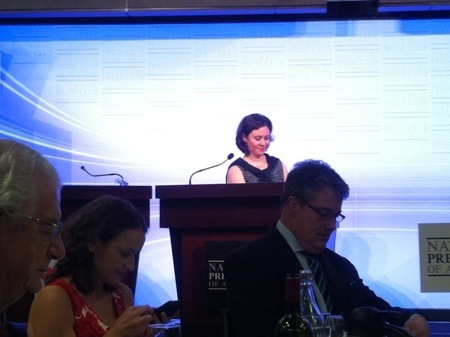 At the National Press Club today	What makes a safe driver? If you didn’t see Mary Kissel’s speech and want a better understanding of the current state of American politics, watch it! It is somewhat unfortunate but true that the majority of the Australian media, either for lack of room or interest, does not provide a complete picture when it covers American political and economic news. It is understandable, as most US news outlets do the same for Australian news, but it is also frustrating at times when basic facts about American politics are relatively unknown in Australia and vice-versa. This is why I sought out US talk radio back in 2008, and why I was so impressed today with Mary Kissel’s address to the National Press Club. Mary eloquently explained the current state of affairs in the US and how it differs from the version of events which is generally reported outside the US. It was fascinating and reassuring to hear from an American journalist that most of the things which I know to be true about the current state of US politics (as I take an active interest and do not rely entirely on Australian media reports) are in fact the truth. It was also very exciting to hear such information being espoused on as mainstream a stage as the National Press Club. I expect that Mary’s address will be on ABC iView or YouTube soon. As I’m writing this on my phone it is a little hard to check, but I will post a link at the first available opportunity.